Looking for quick and easy summer recipes? Try this modern variation of the traditional sour cream cake. Every summer I want to leave behind those complicated layer-cakes from winter with their heavy buttercream, and instead embrace light and airy desserts. Smetannik, with its fresh berries, is first on my to-cook list. The cake’s name derives from the Slavic word, “smetana,” which means sour cream – one of the most common items in every Russian fridge. Not only can you use it as a topping for pancakes, soups and salads, but you can also use it to make a delicious cake. Smetannik’s main advantage is that the ingredients are simple, as is the cooking process. Overall, it’s one of the best sweet summer courses, precisely because it’s not too sugary. The key is in the cream: a simple combination of sugar and sour cream gives a unique slightly sour and smooth flavor. Actually, the traditional smetannik is made from basic cocoa sponge layers and two-ingredient sweet sour cream. Personally, I prefer so-called ‘fusion smetannik’ in a glass. 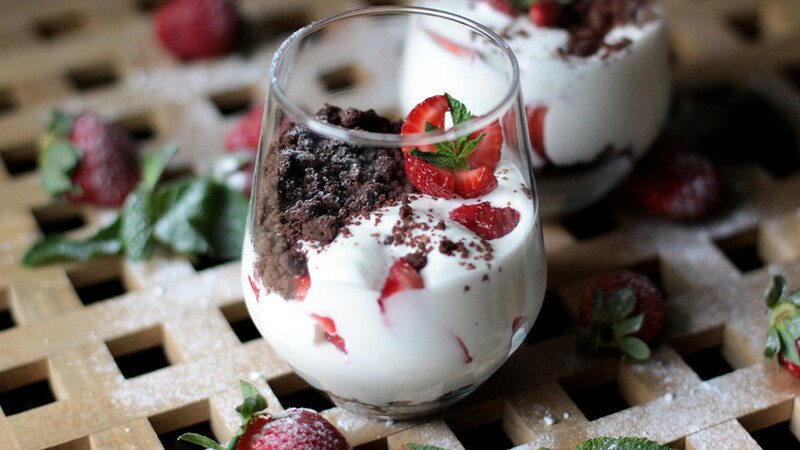 You combine the cream, fresh strawberry and crunchy cocoa streusel crumbs in a glass, and you’ll have an amazing silky smetannik. In case you have no time for a cake, but still want to make an impressive dessert, smetannik in a glass is for you. 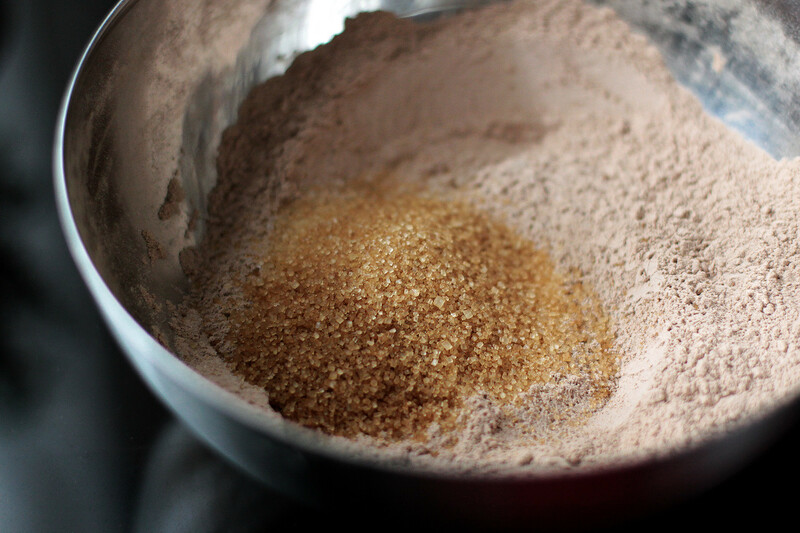 To make the streusel, first mix flour, cocoa powder, baking powder, salt and sugar in a bowl. 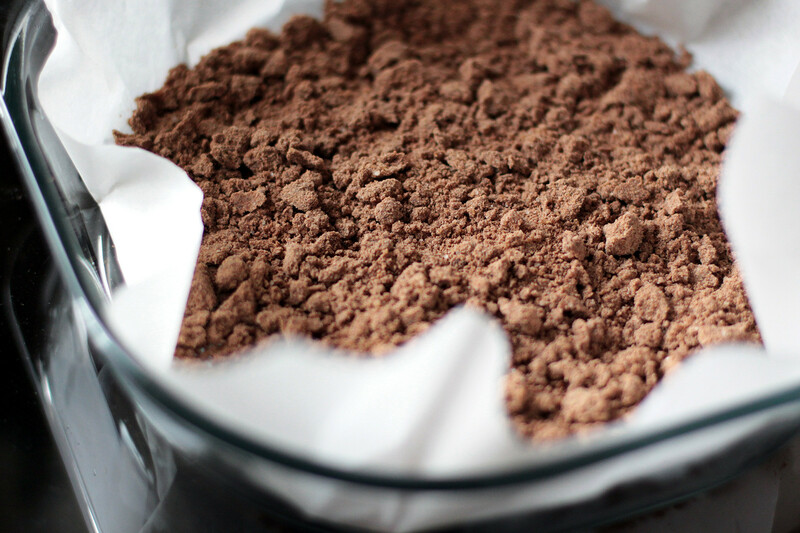 You can add more, or less, cocoa depending on how chocolatey you want the streusel to be. 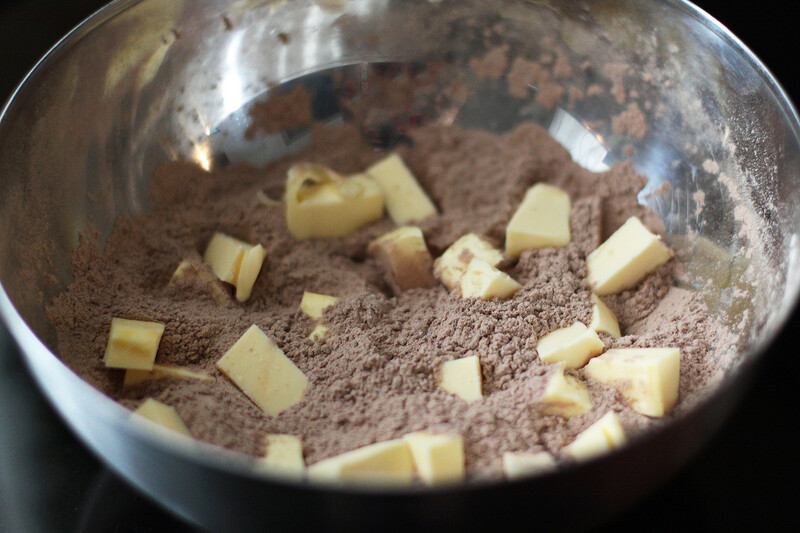 Next, take cold butter and knead into the dry ingredients with your hands. You should get a short and sandy texture that crumbles when you touch it – here is your streusel. Before doing this, I prefer to leave the dough in the fridge for about 40 minutes so it becomes even thicker and the crumbs are even. Put the streusel crumbs in a baking pan covered with a piece of parchment and bake at 180°C for about 30 minutes. At 10-minute intervals I take the streusel out of the oven and slightly stir it so the crumbs cook evenly. The streusel is ready when it is crunchy and crispy. Set your hot streusel aside and start work on the cream. 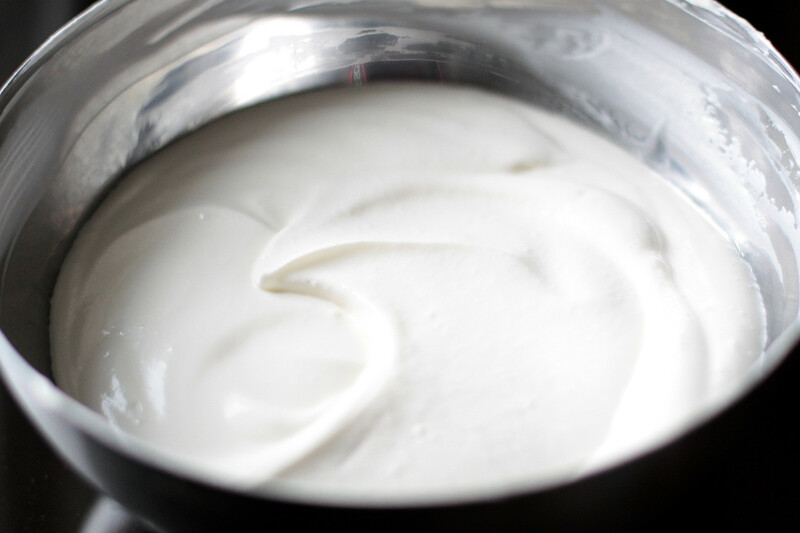 Whisk cold sour cream with a small amount of powdered sugar until it thickens. I usually add 2-3 tablespoons of icing sugar so that the cream acquires its unique slightly sourish taste. You can leave the cream like this, but I highly advise adding a little whipped cream to give a delicious silky texture. Carefully stir it into the sour cream with a spatula. Finally, chop fresh strawberry and start putting your smetannik layers together in glasses. Spoon some streusel, then add about three tablespoons of the cream mixed with chopped strawberry and finish with another layer of the crunchy streusel on top. Leave your masterpiece in the fridge for a couple of hours, or even better, overnight. 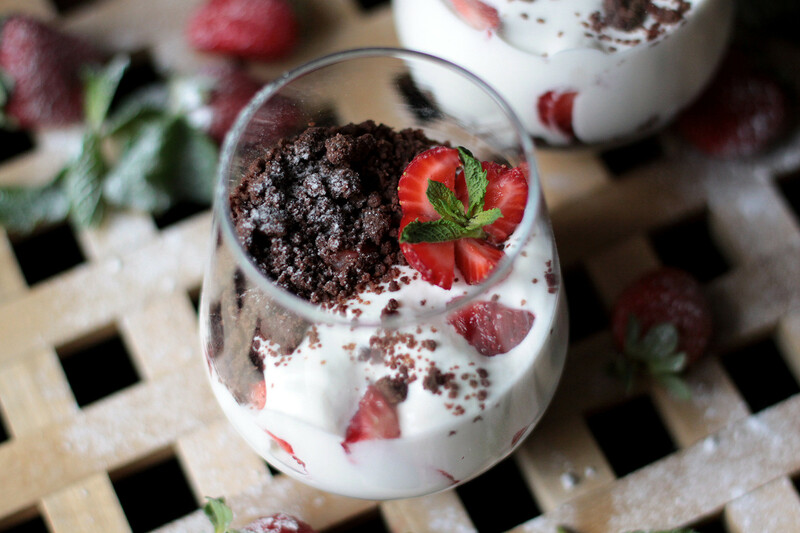 Your silky cream will turn into a tender mousse – it’s gastronomical magic. Enjoy your amazing summer dessert with a cappuccino. You won’t regret this guilty pleasure. If you want to surprise your family and friends with a delicious and easy-to-make apple treat - something instead of regular apple pie - then our recipe is definitely for you.